The 2009 Beneteau Antares 13.80 motor boat is a smart choice for those wishing to experience a new sense of freedom in style and comfort. 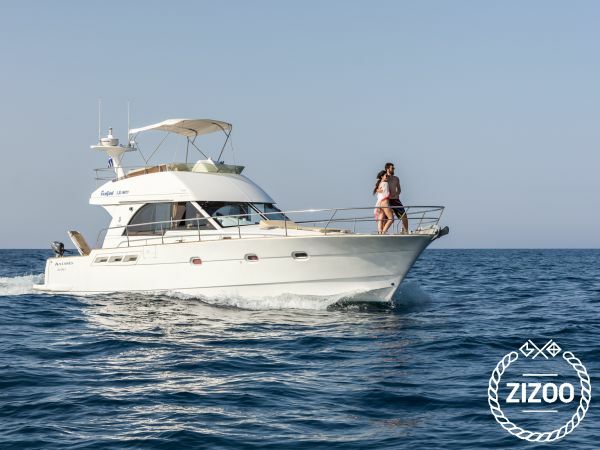 Jump aboard this Beneteau Antares 13.80 in Rethymno or send request to came to you and get ready for a high-speed adventure at sea with your friends and family. You can rent this powerboat and enjoy daily trips in Crete or longer trips in Greek Islands . The Beneteau Antares 13.80 accommodates up to 10 guests and is perfect for exploring secluded coves and beaches in Greece. The crew consists of a experenced skipper and a hostess. The price of crew and welcome pack(soft drinks, wine fruits) are included in the price. For Duration 1 - 5 overnight or more the departure from Marina of Rethymno or upon request by another harbour - Greek Islands. We seek to organize the perfect trip for your needs! Gazal Yacht combines safety, powerful performance and high quality. The yacht is equipped with all necessary safety equipment. The yacht's efficiency will amaze you and its hi tech innovation will make life aboard so much easier. Perfect navigation with Garmin: Garmin GPSMap 7412xsv and 7408 (gps/plotter/echo sounder/radar) The Beneteau Antares 13.80 is located in Rethimno (Réthymnon), Rethymno, a convenient base to start exploring Rethymno on a chartered motor boat. Learn more about the Beneteau Antares 13.80 motor boat below. We hope to welcome you soon on Gazal Yacht!